From the ornate grandeur of "Suite: Judy Blue Eyes" to one of the most stirring protest songs ever written, "Ohio," it's hard to imagine a soundtrack of the late Sixties and early Seventies without the songs of David Crosby, Graham Nash, Stephen Stills and Neil Young. All four would never deny their mercurial history as collaborators and friends-turned-foes, but at a critical juncture, they harnessed their collective egos and set aside solo aspirations to create a band that, as either a quartet or trio, still defines this country's counterculture soul. Fifty years ago, Crosby, Stills and Nash's first private performance took place in July 1968 at a gathering (or party) that's the stuff of Laurel Canyon legend — and some disagreement between Crosby, Stills and Nash. Whether the trio's impromptu set took place in Joni Mitchell's living room (that's Nash and Crosby's story) or by Mama Cass Elliot's dining room table (what Stills recalls) could be argued into infinity. At the time, all three musicians were in rocky transitions from their former or soon-to-be-former bands: the Byrds (Crosby), Buffalo Springfield (Stills), and the Hollies (Nash). Their intuitive convergence that day, singing Stills' prescient song, "You Don't Have To Cry," is one of rock 'n' roll's more divine examples of serendipity. That summer of CSN's birth was a bleak time in America, a nation reeling following the June assassination of Senator Robert F. Kennedy, the arrest of James Earl Ray that same month for the murder of Martin Luther King, Jr. in April, and the ghastly drone of the Vietnam War. In that roiling aftermath of grief and anger, what Crosby, Stills and Nash forged at that impromptu Laurel Canyon jam augured a refreshed direction for acoustic-driven rock and the articulation of dissent. The three musicians quickly traveled to London so that Nash could officially quit the Hollies. They rehearsed in Britain and then searched for a label; they auditioned for Apple Records and were rejected, but found a home with Ahmet Ertegun's Atlantic Records. Neil Young, who had also been in Buffalo Springfield with Stills (as was Crosby, replacing Young at Monterey Pop), was integrated into the group in August of 1969 at Ertegun's suggestion. (Stills once said that he wanted to be in the Beatles, but the solo-focused Young wanted to be Bob Dylan.) Their second public gig as a quartet — but mostly as a trio since Young didn't want to be filmed — was an auspicious one, at Woodstock in the early hours of Monday, August 18, 1969 (they were slated for Sunday night, but the sets ran long). From those fractious years of the late Sixties until present day, the songs of Crosby, Stills, and Nash — with and without Young — became a calling card of Southern California's shaggy folk rock aesthetic, spirit, and sound, as well as an arbiter of social change. It's significant that CSNY, a quartet so readily identified as an American treasure, was comprised of two immigrants to the States — an Englishman (Nash) and a Canadian (Young) — and two Americans, a Texan (Stills) and a Californian (Crosby). Like a four-headed hydra, each member of Crosby, Stills, Nash & Young functioned quite well on his own and each man ferociously exercised that privilege — their solo releases outnumber anything they released as a group. (Of eight studio albums, three included Young.) As beautifully intuitive as their sweet harmonies and live jams could be, CSNY's volcanic arguments and frequent estrangements were toxic to their process. "If you give a bunch of very young guys millions of dollars and get them high as kites and let them loose," Crosby told Mojo in 2014, "it's just sort of inevitable." A drugs-and-drink driven 1974 tour, which garnered the dubious moniker of the "Doom Tour," certainly didn't help ease the friction between the men, although there was always that distant hope from long-suffering fans that a détente would come about — and it often did for a tour. Although the last CSNY studio album was 1999's Looking Forward, the quartet's last reunion tour was more recent, a dozen years ago, in 2006. Crosby vaguely raised speculation, early in 2018, that CSNY could be on the cusp of another revival, finding common ground via their mutual discontent with the current American president; but Nash has firmly demurred, saying a reunion of either CSN or CSNY is extremely unlikely. For fans who were there from the beginning, it's impossible to listen to the "first side" of 1970's Déjà Vu without wanting to pick up a placard and take to the streets, protesting inequity and injustice. It's a tour de force of songwriting: the aggressively-strummed punch of Stills' "Carry On," Nash's gentle "Teach Your Children," Crosby's electric blues squawk, "Almost Cut My Hair," Young's quaking "Helpless," and a gritty cover of Mitchell's "Woodstock." Déjà Vu isn't just an album; it's a manifesto. Although the spark of revolution had cooled somewhat by the early '80s, later albums, like CSN's fourth studio release, 1982's Daylight Again, succeeded in a very different way. Originally meant to be a Stills and Nash project until Crosby was crowbarred back into the lineup by the label, it featured dreamy hit singles like "Southern Cross" and the lilting "Wasted on the Way" that ended up on MTV, introducing a post-punk generation to a band that their parents loved. Despite the critical disappointment of Looking Forward, even songs like the pensively pretty Young-written title track and Crosby's "Stand and Be Counted," inspired by the 1989 student protests in Tiananmen Square, strove to inspire a new crop of mindful listeners, decades removed from the Vietnam War years. In fact, it's Crosby, Still, Nash and Young's enduring influence on scores of contemporary musicians that is one of their most potent accomplishments: Fleet Foxes, My Morning Jacket, Band of Horses, First Aid Kit, Mumford and Sons, the Shins, Dawes, Haim, Rilo Kiley, Jayhawks and hundreds more all owe a debt to albums like Déjà Vu. Today, Crosby, Stills, Nash and Young thrive as solo artists (Young is already an FUV Essentials artist for his lengthy career). Given the rugged individualism of all of CSN and CSNY's albums, as songwriters, all four men are FUV Essentials. But for the breathtaking confluence of their mellifluous harmonies, their virtuosic guitarmanship, and for galvanizing a generation of young people to rise, protest, and articulate their hopes for a fair, compassionate, and peaceful America, CSN and CSNY — the bands — are FUV Essentials. Listen to "Sunday Supper" host John Platt's new interview with Graham Nash airing this Sunday, August 19, at 7 p.m. EDT on 90.7FM WFUV, also streaming at WFUV.org. 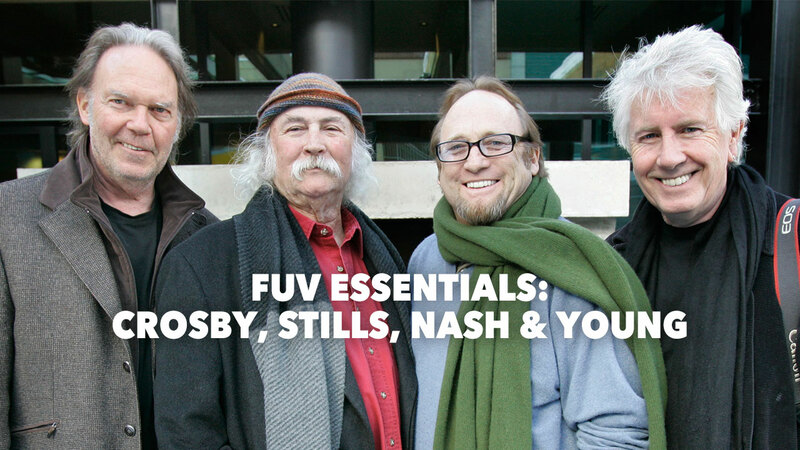 In addition, Nash talks about his "Five Essential CSNY Songs" on FUV Live at 8 p.m. EDT this Wednesday, August 15.